You can now publish Adobe Director movies for the Apple iOS platform. The Publishing dialog box contains new options (iOS Projector option and iOS tab) that lets you create an application that can run on the iOS platform. The Shockwave Player runtime is embedded within the iOS application. The embedded runtime interprets the dir/dcr files that are also embedded within the application. In Publish Settings, click the Formats tab, and select iOS Projector. Click the iOS tab, and specify the details. iOS App Name: The name of the application as you want it to appear on iOS devices. iOS App Bundle Identifier: Unique identifier for the app as registered in the iTunes store. This ID is used by Apple to detect upgrades and newer versions of the app. Any values that you have specified for these fields earlier in the info.plist file will be overwritten with the values you provide in the iOS tab. 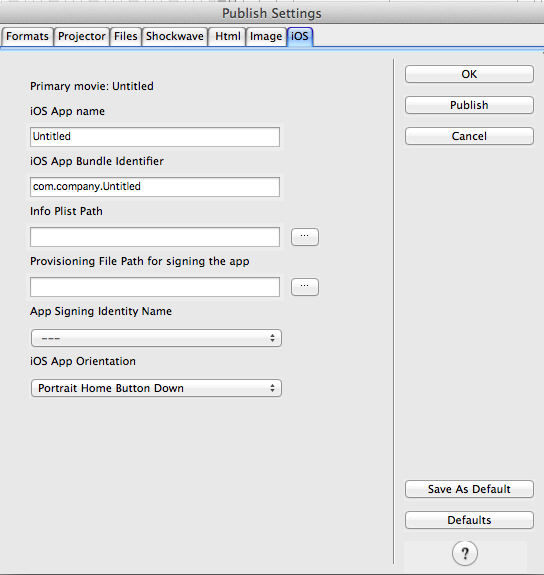 Provisioning File Path For Signing The App and: Create the mobile Provisioning file path by referring to the information at https://developer.apple.com/ios/manage/distribution/index.action. Download the mobile Provisioning file path after creating it and then point the file to the "Provisioning file path for signing the app" field. App Signing Identity Name: Create the Developer/Distribution certificate by referring to the information at https://developer.apple.com/ios/manage/distribution/index.action. After creating the certificate, include the certificates in your Keychain by double-clicking the certificate. When you do so, the "App signing Identity name" is populated with the list of installed certificates and you can select the required certificates. iOS App Orientation: Select an orientation for the app from the list. The accelerometer values for an iOS device can be accessed from lingo using the _accelerometer object. _accelerometer has three properties x, y, and z that represent x, y, and z axes of device's accelerometer respectively. &nbsp;One can either assign _accelerometer to a variable, or use the _accelerometer property directly to access the accelerometer object’s properties. The gyroscope values for and iOS device can be accessed from lingo using the _gyroscope object. _gyroscope has three properties x, y, and z that represent x, y, and z axes of a device's gyroscope respectively. One can either assign _gyroscope to a variable, or use the _gyroscope property directly to access the gyroscope object’s properties. Maintains a list of all current touch objects. Returns the total number of touches at the current time, which will be equal to the size of allTouches list. _touches.count can also be used for the same purpose. Returns the total number of objects that have been moved which will be equal to the size of lastMoved list. Returns the 'X' location of the touch. Returns the 'Y' location of the touch. A unique read-only ID that can be used to track the touches. Returns which state the current touch object is in (Begin/moved/cancelled). Lingo Developers may register for any Gesture supported by Adobe Director using the "registerGesture" call on the "_touches" object. User-defined callback to handle the Gesture. First parameter "swipeRightGesture" is the Symbol and "handleSwipeRight" is the user defined callback. For Pinch & Rotate, Lingo returns a value that can be handled in the callback function. An application can be bound to a custom URL scheme on iOS. This allows the application to be launched from either a browser or any another application on the same device (iPhone/iPad). Director 12.0 allows you to set custom URL schemes for applications via publishing to iOS feature. It means that you can have a custom URL link such as “myApp://goto.url.com/reference” and on accessing the link, the application is launched. The iOS SDK natively supports custom URL Schemes for its applications. The Shockwave application of Director 12.0 for iOS leverages this feature to facilitate custom URL Schemes. How to implement this in your Adobe Director movie? Allow your Adobe Director movie to use the new event handler "on handleOpenURL". Then use "_movie.openURL" attribute to access the incoming URL scheme. This is a persistent attribute which you can refer anywhere in the movie and also across application instances. Finally you need to register your app with iOS for the custom URL scheme by editing the Info.plist file of the application. 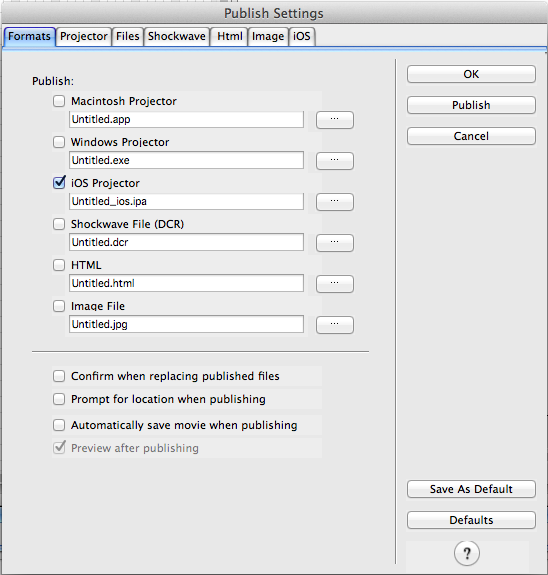 Director provides options to choose the modified Info.plist file in the Publish Settings iOS dialog. On the Publish Settings dialog, you need to add "CFBundleURLTypes" key with its attributes "CFBundleURLSchemes" and "CFBundleURLName". You can now display text for Adobe Director iOS apps. Currently, only the fonts available on the device are supported.&nbsp; Classic toolbar tools such as buttons, radio buttons, and check boxes will display text and can be used for basic functionality. All font styles on the iOS devices are supported. If a specific font is not available on a device, the closest match to the font on the device or the default font is applied. Various text properties such as color, background, and size are supported. Formatting of text, such as, Bold and Italic are supported. Paragraph styles (Alignment, Line Spacing, Indents, and Custom tab spaces) are supported. For non-editable text, individual formatting for every character is supported. A text box can now contain text with a combination of text formatting such as fonts, colors, and styles. Scrollable text is supported. The scrollbar shown on the desktop versions are replaced with a temporary scrollbar that only appears when scrolling (dragging) the text. For editable text members, formatting of the first character is applied to the whole text box. When you apply a style to an editable text member, the text member is not rendered immediately. The text member is rendered with the applied style only when you edit it. Kerning/Character spacing is not supported in paragraph styles. Hyperlinks are supported. However, hyperlink is applied to entire text boxes and not ranges of text within the boxes. For example, if a single word is hyperlinked in a text member, clicking on any word in the textbox will direct the user to the link. charPosToLoc(), locToCharPos(), locVToLinePos() and similar functions will not work. Field members are not working as expected. Underline and strikethrough styles are not supported. 3D Text is not supported. Adobe Director 12 extends support for High Resolution Retina Display. You can enable High Resolution mode for Movies or games created using Director. Use the following read-only property to enable retina display mode. If the iOS device you are publishing to supports Retina Display, then Director enables Retina Display mode by default (sets screenScale to 2.0). To explicitly disable it, add a Info.plist value of YES (Boolean) for the key DIR_disable_retina. In this case, even if the device supports retina display, the app will be run in non-retina mode and the screenScale value reads as 1.0. Read the value of _player.screenScale using Lingo and assign appropriate images and textures to support Retina Display in the movie. It means that if the screenScale value is 2.0, use a high resolution image. Physics for iOS (Dynamiks Xtra) uses PhysX SDK v3.2.0 from Nvidia while the current desktop version uses PhysX SDK v2.7.2. Since there are slight changes in the interfaces in the newer version of PhysX SDK, we are providing a new version of Dynamiks Xtra for Mac. Two versions of Dynamiks Xtra have been enabled for use on MAC, Dynamiks.xtra and Dynamiks_320.xtra. The Dynamiks_320.xtra can be used while authoring movies for iOS platform to preview how the end result looks on idevices. For rigid body methods such as applyForce(vector vForce, vector vPosition), you may have to manipulate the vForce vector and specify higher values to generate the same effect as the previous builds. SWF output files created for Flash 10 or earlier are supported. Avoid using Flash components from the Tools menu. Note: As Flash Xtra support is still in progress, you may observe that for some movies the colors do not render properly. Director 12 extends support for iAds Manager Xtra, thereby allowing you to invoke and display ads within games. Take advantage of this feature to display relevant banner ads retrieved from the Apple iAds server. For more information, refer to this link. Initializes a banner at the HideInLocation point within a game. On loading the Ad, the ad is moved to the ShowInLocation point. Using two different points to initialize and display the ad allows you to display ads that have animations or interactivity. You may choose to set HideInLocation and ShowInLocation values as the same if the Ad does not contain any animation or interactivity. Returns the size of the Banner View as a point data type. Allows you to modify the position of the ad banner. The ad is moved to the ShowInLocation point. Using two different points to initialize and display the ad allows you to display ads that have animations or interactivity. You may choose to set HideInLocation and ShowInLocation values as the same if the Ad does not contain any animation or interactivity. Restricts BannerAdView action that is called when banner ad is clicked. It is set to true by default. Is called back when a user clicks the ad banner. Is called back when a user finishes viewing the ad. Is called back on successfully loading the ad. Is called back when an ad fails to load. Adobe Director 12 extends support for the iOS Store Kit. Store Kit communicates with the App Store on behalf of your application. Your application uses Store Kit to receive localized information from the App Store about products you want to offer in your application. CurrencyString: Price in local currecy format (string). For example, $25. Store Kit Xtra needs a callback function that can inform lingo about the status or result of purchase transactions. The SetTransactionHandler method allows you to implement the same. The TransactionStatusHandler is called by Store Kit Xtra with a property list as argument. Allows you to purchase any In-App product. Note that this is an asynchronous call. The result will be returned to Transaction Handler set using SetTransactionHandler call. Restores transactions for non-consumable products, auto-renewable subscriptions and free subscriptions. This method allows a user to add the product to other devices or, if the original device was wiped, to restore the transaction on the original device. Event handlers onActivateApplication and onDeactivateApplication are now supported on iOS also. onActivateApplication handler will be called when the iOS Director APP comes to the foreground and onDeactivateApplication handler will be called when the iOS APP goes to the background. These handlers must be called from a MovieScript . For more information, see this article in Adobe Director help. There is no auto-download of Xtras because iOS does not support code download and execution at runtime. That is, all Xtras used by the movie should be embedded within the application. Normal map and Parallax map effects are not yet supported in 3D Xtra. Bitmap palettes and Transitions are not working. Users can open the existing Adobe Director 11.X movies and create the iOS version. However, if the movies use Havok Xtra or are created using Adobe Director version 10.x or lower, you cannot create the iOS apps out of such movies. 8-bit and 16-bit Bitmap images are not supported. 24-bit and 32-bit audio files are not supported. (Physics) Value of property contactTolerance is not supported. (Physics) Rigid body properties, angularMomentum and linearMomentum, are not supported.